Tides occur because of the pull of gravity of the Moon and the Sun on the Earth's oceans. Because the Moon is closer to the Earth, it has the greatest effect on our tides. There are approximately 2 high tides and 2 low tides every 24 hours. 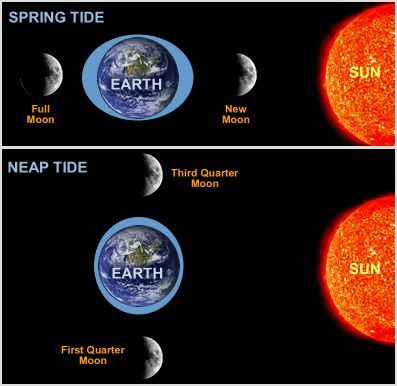 Spring tides (often called 'king tides' by fishermen) occur at New Moon and Full Moon when the Sun, the Moon and the Earth are in line. This forms extremely high high-tides and extremely low low-tides. Neap tides occur at First Quarter and Last Quarter, when the Sun, the Earth and the Moon are at right angles. This forms quite low high-tides and quite high low-tides. Eclipses occur when a large shadow travels across the surface of the Earth. Umbra - The Umbra is the darker part of the shadow. Penumbra - The Penumbra is the lighter part of the shadow. Total Eclipse - Observers on the Earth's surface who are shadowed by the darker umbra would see a total eclipse. Partial Eclipse - Observers on the Earth's surface who are shadowed by the lighter penumbra would see a partial eclipse. Solar Eclipses occur sometimes when the Moon passes between the Sun and the Earth at New Moon. The shadow of the Moon falls on the Earth appearing to block out (eclipse) the Sun. The next total solar eclipse is 13th November 2012. Lunar Eclipses occur sometimes when the Moon passes on the opposite side of the Earth from the Sun at Full Moon. The Moon passes in the Earth's shadow. It appears dull and can only just be seen. The next total lunar eclipse is 15th April 2014. The Earth's rotation causes the change of day and night. The Earth rotates on its axis once every 23 hours and 56 minutes. The rotation of the Earth is west to east, so the Sun is visible in the eastern sky first. The Sun shines only on half of the Earth at any time, so that half the Earth is in daylight and the other half is in darkness. The tilt on the Earth's axis causes day and night to be of different lengths in different parts of the world. A solstice occurs twice a year. The summer solstice is the longest day (and shortest night) of the year. The winter solstice is the shortest day of the year. An equinox occurs twice a year when day and night are of equal length. Seasons are caused by the Earth's revolution around the Sun and the unchanging tilt of the Earth's axis. The different distances to the Sun caused by the tilt do not cause the seasons. The season depends on how much of the Earth's surface is covered by light rays, and at what angle they reach the Earth's surface. Head-on rays on a small area are strong and cause summer seasons. Slanting rays focusing on a large area are weaker and cause winter seasons.